"We're calling it..." Lucinda waved her arms dramatically. "Jhudora." "But we're going to italicize it. Italics are all the rage nowadays." Whatever the reason, it always seems to be in the fall season when our Neopets ask for a new color. 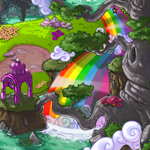 So, for those who have decided that it is indeed time for their Neopets to get a makeover and want something that's going to go perfectly with the beautiful fall season and colors of harvests, pumpkins and leaves, this guide is for you! Here is a comprehensive list of lovely fall themed colors to consider and why it is that they are so fitting for the season! "You have no idea how long it took me to prepare for this moment," she said, cracking her knuckles. Bluish sparks sizzled briefly around her hands. "I practiced spells during my work hours. I probably made more healing potions than you cook up in a whole year, for all the pets who will need them in my absence! Tonight is the night I finally beat you..."
Today I had the incredible opportunity to meet and interview one of the most famous Alien Aishas out there, Farvin III. When King Skarl woke up, that morning, something was a little... different. "After we have contacted the Brain Tree, we will pick up our passengers from the Order of the Red Erisim and head to the desert ourselves..."
Don't forget about the Library Faerie this Faerie Festival!